Must visit places in cultural and historical Greece! Comments Off on Must visit places in cultural and historical Greece! Acropolis in Athens, Ancient Delphi, Knossos Palace in Crete, Ancient Epidaurus, Dion, Ancient Dodona, Ancient Olympia, Mycenae, Mystras and more. Acropolis of Athens Acropolis of Athens is the most famous historical monument of Greece. 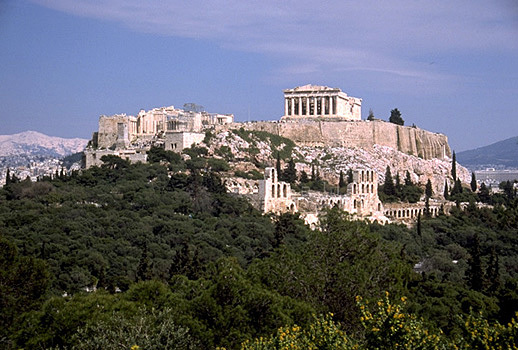 It was constructed in the mid 5th century BC, also known as the Golden Century of Athens. Although the most famous building on the Acropolis is the Parthenon, there are many other builings, like the Propylaea, the Erectheion and the Temple of Athena Nike. The Acropolis was entirely made of the finest Pentelic marble and by the best craftsmen of the era. Ancient Delphi Located on the slopes of Mount Parnassus, Delphi is among the most interesting historical sites and ancient monuments in Greece. In the ancient times, this was the most famous oracle and pilgrims from all over the Mediterranean would come to ask for the prophecy of god Apollo. Along time, Delphi also served as the centre of a political and military association for many city-states of Central Greece. The most famous sights in Ancient Delphi are the Temple of Apollo, the Ancient Theatre, the Ancient Stadium and the Temple of Athena Pronea. Minoan Palace of Knossos In a short distance of 5 km from Heraklion Town, Knossos is the most important sight in Crete island. Discovered in the early 20th century by the British archaeologist Sir Arthur Evans, the site was found almost intact and covered by ashes. This led scientists believe that the palace was destroyed by a tsunami wave caused by the volcanic eruption of Santorini in about 1,500 BC. Amazingly enough, after many centuries under the ashes, the monumental Palace of Knossos has kept its colours and interesting wall paintings. Ancient Epidaurus Located on the eastern side of Peloponnese, Ancient Epidaurus is mostly famous for its open theatre with the impressive acoustics. This theatre was constructed in the late 4th century AD by architect Polykleitos on the site of a former theatre. The Ancient Theatre of Epidaurus never hosted original dramas but repetitions of famous plays. It was constructed right next to the Sanctuary of Asklepius, the healing god. The Asklepeion (healing centre) of Epidaurus was very famous in the antiquity as it was constructed on the birthplace of the god. Dion The Sanctuary of Dion was dedicated to god Zeus (Dias in Greek). As it is located on the grounds of Mount Olympus, it was considered the closest sanctuary to the gods. From the very ancient times, there was an alter on the site to honor the Olympian Gods, but Dion largely developed during the Macedonian times. In fact, Alexander the Great made sacrifices to the gods there, asking them to favour his expedition to Asia. The site also developed in the Roman times, as visitors can see remains of a Roman villa and mosaics. Ancient Dodona The ancient site of Dodona is located on the north western side of Greece, in the region of Epirus. This was the second most famous oracle in Greece, after the Oracle of Delphi. Originally the oracle was devoted to a Mother Goddess, which was either Rhea or Gaia. However, in the historical times, the altar was dedicated to god Zeus. Dodona remained an important religious sanctuary until the rise of Christianity in the Late Roman Times. The most important sight there is the Ancient Theatre of Dodona. Ancient Olympia Olympia is the place where the first ancient Olympic Games took place in 776 BC. These games were organized every four years to honor god Zeus and according to the myth it was the famous hero Hercules who started these games. Gradually these sports competitions became very important for all the Greek cities and it was considered a great honor for a city-state if their athlete won in the Olympic Games. The temples of Zeus and Hera and the Ancient Stadium are today the most important sights in Ancient Olympia, while excavations are still continued. Mycenae Located on the north eastern side of Peloponnese, the town of Mycenae gave its name to an entire civilization, the Mycenaean civilization. The giagantic city walls that are said to have been built by Cyclops, the Lion Gate and the Treasury of Atreus are the most important monuments and sights in Mycenae. Right next to the ancient site, there is an interesting Archaeological Museum. Mystras The Castle Town of Mystras was the second most important town after Constantinople during the last decades of the Byzantine Empire. This town provided the Empire with the last emperors, descending from the Paleologos family, and was also the last Byzantine stronghold to fall to the Ottomans. On top of the Castle of Mystras, there is the Palace of the Despots, giving wonderful view to the valley below. Around the castle town, there are many Byzantine churches with impressive architecture and interesting wall paintings. Medieval Fortress of Nafplion The Fortress of Nafplio is known as Palamidi and it is constructed on top of a huge rock above the town. This is a typical sample of the many Medieval Castles that can be seen spreading around Greece. It is well-preserved and has protected the town from many wars and invasions along centuries. Originally the Fortress of Palamidi was constructed in the 17th century by the Venetians, but was also reinforced by the Ottomans in the early 19th century. Due to its high location, the castle gives amazing view to the valley below and the sea. Minoan Akrotiri The Minoan Town of Akrotiri is located on the southern side of Santorini island and it is the second best preserved site from the Minoan times, after Knossos. Due to trade, Akrotiri was a very developed town in the antiquity. The works also revealed a town with two-storey houses, public buildings, storehouses, even a sewerage system. As the town was found covered with volcanic ashes, it is believed that the inhabitants abandoned when the volcano of Santorini erupted about 1,500 BC.